Count that a red-letter day on your calendar when first you see either this tiny, dainty sprite, or his next of kin, the golden-crowned kinglet, fluttering, twinkling about the evergreens. In republican America we don’t often have the chance to meet two crowned heads. Energetic as wrens, restless as warblers, and as perpetually looking for insect food, the kinglets flit with a sudden, jerking motion from twig to twig among the trees and bushes, now on the lawn, now in the orchard and presently in the hedgerow down the lane. They have a pretty trick of lifting and flitting their wings every little while. The bluebird and pine grosbeak have it too, but their much larger, trembling wings seem far less nervous. Happily the kinglets are not at all shy; no bird is that is hatched out so far north that it never sees a human being until it travels southward to spend the winter. Alas! It is the birds that know us too well that are often the most afraid. When the leaves are turning crimson and russet and gold in the autumn, keep a sharp look out for the plump little grayish, olive green birds that are even smaller than wrens, and not very much larger than hummingbirds. Although members of quite a different family—the kinglets are exclusive—they condescend to join the nuthatches and chickadees in the orchard to help clean the farmer’s fruit trees or pick up a morsel at the free lunch counter in zero weather. Love or war is necessary to make the king show us his crown. But vanity or anger is sufficient excuse for lifting the dark feathers that nearly conceal the beauty spot on the top of his head when the midget’s mind is at ease. If you approach very near—and he will allow you to almost touch him—you may see the little patch of brilliant red feathers, it is true, but you will probably get an unexpected, chattering scolding from the little king as he flies away. In the spring his love song is as surprisingly strong in proportion to his size as the wren’s. It seems impossible for such a volume of mellow flute-like melody to pour from a throat so tiny. Before we have a chance to hear it again the singer is off with his tiny queen to nest in some spruce tree beyond the Canadian border. 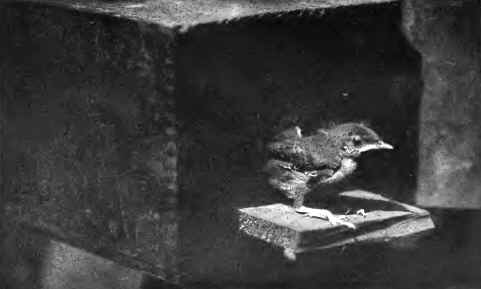 The noisy contents of a soap box: a family of house wrens. 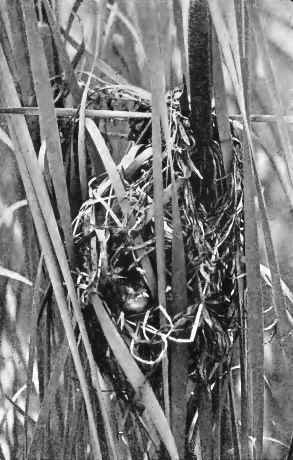 The marsh wren’s round cradle swung among the rushes.